Immediately after college Pastor and Karen were married and that December they began their first pastorate. 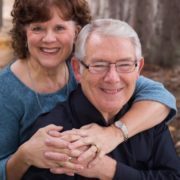 They have been in ministry since that time and are in their 40th year of serving the Lord. They celebrated their 40th wedding anniversary in June of 2012. Pastor and Karen Ray came to Maranatha in August of 1988. At that time the oldest of the 5 children (3 girls and 2 boys) was 11 and the youngest was 4. The kids have grown up at Maranatha, gotten married at Maranatha and dedicated themselves to following the Lord while at Maranatha. By God’s grace three are serving the Lord in full time service. The other two are both faithful in church, one at Maranatha serving with her husband and the other in West Virginia with his family. Although Pastor Ray loves hunting and fishing and motorcycle riding, preaching and teaching the Word of God is his true passion. Preaching through books of the Bible exegetically is a thrill to him as the Bible comes alive and answers contemporary questions. Pastor Jon had the privilege of growing up in a pastor’s household. His dad is still pastoring in Shelby Twp. Mi. His Grandpa Loggans was a pastor for over 50 years. Jon accepted Christ as his personal Savior on October 23, 1983. He was baptized August 5, 1985 at Trinity Baptist Church in Imlay City, Mi. He answered God’s call upon his life on June 22nd, 1989 at Joy Baptist Camp in Vassar, Mi. He graduated from Maranatha Baptist University in 1993 and 2003 with his bachelors in Bible and his Masters in Biblical Counseling. He has worked with young people for over 25 years in Michigan, Wisconsin and Florida. He has a tremendous love for youth of all ages and feels a tremendous burden to not only reach this next generation for Christ, but to see them make a significant impact for Christ! He is wonderfully married to his wife Melissa, and the Lord has blessed them immensely with 8 (soon to be 9) children (Hunter, Maddie, Gunner, Mia, Tag, Piper, Sadie and Hollis)!